This scape is a perfect example of a well thought out and balanced iwagumi style aquascape. In this scape the rock formation not only looks natural, it also looks like it has been in place for a long time as rocks and plants transition seamlessly between one and other. There are many aquascaping styles in our hobby today. One of the most challenging and also most impressive styles is the iwagumi style. 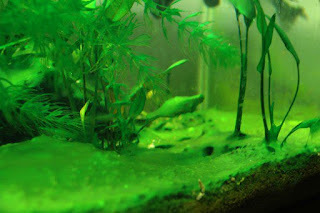 The iwagumi style was popularized by the late Takashi Amano, it was inspired by applying techniques used in the Japanese rock gardens into the aquarium. The name iwagumi itself refers to a layout were rocks play the main role. Though this should not be confused with creating a layout based on stones thrown in at random into the tank, there are rules to follow once creating a iwagumi. First and foremost it’s about designing a rock formation were all rocks are in harmony with each other and with their surroundings. This can be achieved through size, and placement of the rocks in the tank and in how they relate to each other, but mostly through simplicity. The use of small aquatic plants, mostly carpet plants is used to increase the sense of scale and at the same time ensure that the rocks are the focal point of the scape. To create an iwagumi layout the use of natural rocks is essencial, any type of rock picked up from nature can be used, however more detailed rocks like seiryu stones are preferred over flat stones, as these ones add more detail and flow into the overall composition as well as a sense of erosion and age. All rocks should be of the same type, this is a major aquascaping rule and not just for iwagumi, in nature it’s very hard to find different types of rocks in the same place, so why should we put them together in an aquarium, imagine a design with a grey seiryu stone and a brown lava rock, it just would not look natural and harmonious to the viewer. To create a natural looking rock formation, different sizes of rock should be used, this creates depth but also enhances harmony and flow throughout the design. Larger rocks also create focal points that will attract the viewer’s eye. · Oyaishi or master stone – This normally the largest and the most beautiful of the stones used in the layout. This rock will be the focal point of the layout, it should be placed in the aquarium according to the rule of thirds and generally occupies 2/3 of the height of the aquarium. This is done because it is generally considered the perfect positioning for the human eye. It’s also known as the golden ratio or rule. This stone should should also tilted slightly in the direction the water flows, we do this to render a more natural look, similar to stones in a river. After all we are replicating nature. · Fukuishi or secondary stone – This stone is normally the second largest stone of the layout, it should be positioned in relation to the master stone to provide balance and a sense of flow. This stone can also be used to create tension in the aquascape. · Soeishi – This third stone is normally placed next to the master and secondary stones and generally is purpose is to enhance the strength of the first one. · Suteishi or sacrificial stone – This stone or stones as more than one can be used are generally added to the aquascape to increase detail and complement the general composition of the rock formation. This rock is called a sacrificial stone because it normally does not stand out and in many cases it gets completely covered by the plants as they grow. Rocks should be slightly tilted when positioned in the layout, this can create a sense of harmony in flow similar to rocks in the river bed. A rock formation slightly tilted in the same direction can enhance the sense of harmony, extreme tilts should be avoided as they look unnatural and may distract the viewer’s eye. However tilting rocks in opposed directions can result can be put in good use to create tension in the layout, however this technique should not be overused or its impact will be lost. Symmetry is not natural, there is no symmetry in nature. So when designing an iwagumi aquascape an odd number of rocks should be used. Three, five, seven, nine….It really does not matter how many as long as an odd number of them is used. The type of plants recommended on iwagumis is generally limited. Let’s face it we want the rock formation to take center stage in this type of layout so the plant choice is generally limited to carpet plants. Plants like Hemianthus Cuba, glossostigma, monte carlo, dwarf hair grass, stauregeyne reppens are the mostly used in this type of layouts. Harmony and a minimalist look is also important so the use of few or many times just one type of plants is recommended. In this type of layout the type of fish used should be small schooling fish. What you are looking for here is to enhance a sense of simplicity and harmony. A school of carninal tetras, neons or rummynoses all swimming together is the perfect way to achieve it. Size is also obvious as you are trying to enhance the sense of scale and impact of the rock formation so smaller fish are preferred. Single species tanks are preferable as opposed to having many different species mixed together as like I said before harmony and simplicity is key. Iwagumis can be beautiful and simple, which leads to many beginners to try it believing it is an easy way to start. However it is the most difficult style of aquascape to grow and maintain. 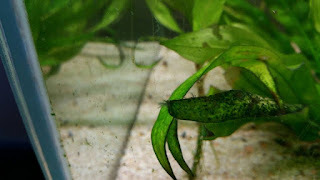 The reason is that the plant choice is limited and the use of carpet plants generally means that plant mass after the initial setup is not enough to balance the aquarium. Algae tends to be a problem throughout the early stages of an iwagumi due to this, the fine balance between light, co2 and nutrients is of the utmost importance and good flow is needed to help plant growth. Aquarium maintenance tends to be more demanding in these type of tanks as the limited plant mass not only creates conditions for algae to develop, it also means that organic build ups need to be kept in check. Daily water changes is suggested during the first two weeks of the layout, fertilization should not be used in the first stages of the setup, or should be used scarcely and upped according to the increase of the plant mass in the aquarium. A good level of co2 should be maintained and light should be reduced to no more than six hours in the early stages of the setup and like fertilization upped as the plants grow. Light intensity should also be controlled if possible to avoid algae outbreaks early on. As the time passes regular pruning and maintenance of the carpet is required to keep it healthy and compact and also to avoid it uprooting. For those with patience and not in a hurry a dry start method is also a good way to bypass the problems of the early stages of the layout. By growing the carpet plants emersed and only flooding when the tank is fully grown many of the challenges highlighted above can be avoided. I hope this article as can help you understand a bit more about iwagumi aquascape, they are fun to create, though challenging to maintain. They are one of the most artistic and beautiful styles of aquascapes to behold its simplicity and minimalism relates back to it's creator Takashi Amano who taught us to find beauty in nature's smallest and simplest creations.